Is the American higher education system out of date? 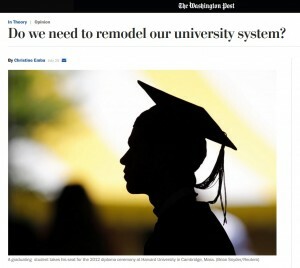 This week, the Washington Post is running a series titled, “Do we need to remodel our university system?” The Post invited me to contribute an essay to the series in which I argue that one of the strengths of our system is the many forms of postsecondary educational institutions we have, and that it provides students with many options. I invite you to read my essay as well as the others in the series.